In between working and eating we’ve still had time to do a few bits and pieces. 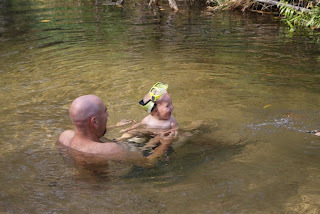 Last night Tim went with Dad and Zack out to a billabong just a few km away from here. Dad and Zack had caught quite a few red claw there the other day so they went back to put some more traps in. Zack threw a line in while Dad and Tim were putting the traps in and he caught a black bream so I imagine Tim will spend an afternoon or two back there in the future. While they were heading through the bush to the billabong they also spotted a wild black pig. Tim is not here to remind me how the story goes but apparently Tim was out front and he had a knife… and there was much creeping and hiding behind trees involved but for now the pig is still very much alive and we had steak and vegies for dinner. I am sure the blokes are convinced the pig’s days are numbered. This morning Jordy, Darcy, Jasmine and I followed Zack down to the little creek that runs behind the café to put some more yabbie traps in there for red claw. 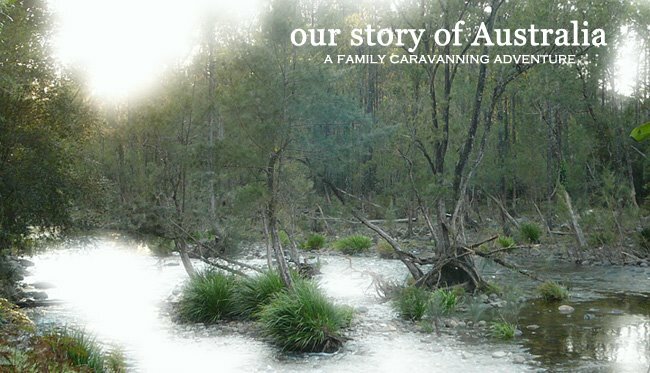 It’s only a small creek and although it flows strongly it’s all bushy and overgrown and there is no way in hell I would swim in it… even though the chances of a croc right here are slim a bloke was attacked a few weeks ago in a nearby river so…. Anyway, there is a little waterhole here and we got a few small red claw about 12-15cm long so they are going to put them in a fish tank and let them get a bit bigger. No idea if it even works that way but they are happy fisherpeople playing with it anyway. Jordy is excited at the moment about his plants that are growing up big real fast. J Dad planted some vegie seeds a few days ago and overnight the wombok seedlings were already up. So each morning we have to go see how big they are getting. I think it’s great cos Jordy really loved our garden at home. 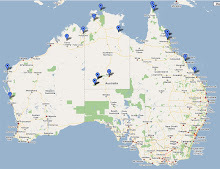 We have not had a chance to get to any of the other Litchfield NP attractions. Although I’ve driven past them I still have not called into the Magnetic Termite Mounds, and we have not seen the other main waterfalls, or Blythe Homestead or anything else. In between the couple of hours work I do each day and general kid-raising stuff I just have not had the time. It will only get busier here at the café though so I’ll have to make time soon. One highlight of this week was meeting a family that we camped near way back at Calliope; Michael, Michelle, and their five girls. They have been traveling and working around Australia for three years. They are staying north of Litchfield and called into the café for breakfast to start their tour of the NP. Because it was early in the day I had the kids with me while I was working in the garden and as soon as Jordy saw all the kids he was off wanting to play. It took a while of chatting before we made the connection that we had met them before (the kids had played together at Calliope but the adults never properly met) but after that we spoke for about another hour. Funnily enough we also ran into them again that afternoon when we went out to the creek for a swim. 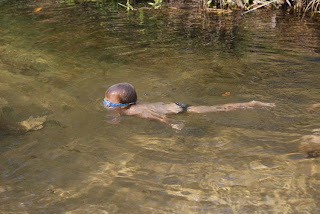 We had mentioned to them that it was a great safe place for children to swim and they had headed there on their way home. So the kids all got to swim and play together again and they had a ball and Tim had a chance to have a proper conversation with them too. We were joined later by a group of people from overseas (Germanic accents but no idea more than that) and after they had a swim one of the women grabbed her guitar and sat on the little bridge and played and sang a few songs. It was a lovely way to spend the afternoon. I’m not sure when Tim and I will get a few days off…. I had to bring a fridge in to Darwin and am taking another one back for work so Mum came with me and we bought the kids in for a change of scene so it’s just a quick trip in. Although I will HAVE to find time to get my legs waxed…. Should I post a before pic? There a lots of ants here and they get stuck in my leg hair. Maybe guys just deal with that but I am not enjoying it. It’s been really hot and muggy here the last couple of days, not sure exactly but past 35‘ for sure. Almost back to wet-season weather. No idea if it is building to rain or not but I think it has bought the bugs out with it. They are everywhere once it gets dark. Luckily by then the kids and I are rarely out of the van. Apart from the ants and bugs! we have also caught (killed) a few snakes around camp. We keep an eye out for them all the time with the kids cos a bite from a Western Brown could possibly kill a child so we are very aware of them and the kids wear gumboots if they are walking anywhere that is not right beside us.